Yaaaay – it happened! He came. And the angelic response to this in the heavenlies that night was worship to God (“Glory to God in the highest”) and declaration of blessings to mankind, who now had a Savior (“peace, goodwill toward men!“). Why celebrate? Would offend God if we just got happy and decorated our houses because Jesus, God’s Son came? In the book of Ezra, there was a celebration so raucous when the foundation of the temple was finished – the rejoicing was so loud the noise was heard far away. The Bible is full of dramatic worship and celebrating. But the things we do when we celebrate and decorate have much symbolic meaning at their very root. We can imprint our children and grandchildren and impact others with the truth in our celebrating. I welcome the symbols for the freedom they give me to declare Christ at this time of year more than at any other. Christmas literally means: Christ Mass. Mass is: our worship/prayers, and ceremonies commemorating the sacrifice of the Body and Blood of Jesus Christ. Everytime we say “Merry Christmas,” we are declaring Christ! In the colors – the gold is like the gold the Wise Men brought as worship; green represents everlasting, abundant life; “Though your sins be as scarlet, they shall be white as snow,” the white snow covering the ground reminds me of the grace of God covering my sin and imperfection; the red reminds me of the blood that baby Messiah, once grown, spilled in a gruesome sacrifice for my sin – and because of all the forgiveness I have needed, red will forever and always be part of my personal celebration decoration, regardless of what fashions prevail. Do you believe I could go on? 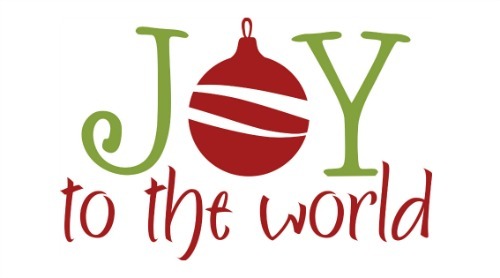 I could because I have chosen to “joy” in Christmas and celebrate extravagantly. The study notes say this Hebrew word for joy speaks of “dancing or leaping for joy,” that it indicates “spinning around with intense motion.” And note, please – it is a verb. Yes, it would seem the world becomes increasingly Godless. No, most people have no idea what Christmas is suppose to be or the total truth of what they are celebrating, but I do know. And I will joy because He’s here! He came! I have a Savior! NOTE TO SELF: be glad, rejoice, celebrate, spin around and dance, be exceedingly glad and pass on the good news that a Savior came – for all people! I love your "Notes to Self" It is so true that what is easy for us to pass along is much harder to embrace for ourselves. We should all leave "Notes to self" Rejoice my friend, for the Lord is with you. Psalm 118:24-29 This is the day the LORD has made; let us rejoice and be glad in it. O LORD, save us; O LORD, grant us success. Blessed is he who comes in the name of the LORD. From the house of the LORD we bless you. The LORD is God, and he has made his light shine upon us. With boughs in hand, join in the festal procession up to the horns of the altar. You are my God, and I will give you thanks; you are my God, and I will exalt you. Give thanks to the LORD, for he is good; his love endures forever. Wow, Marie – I have read this blessing from you several times. Thank-you again!